The following article is written by Gaurav Bansal, Principal at Alacrity India. Gaurav goes back to some basics and offers great reminders as to why the world is headed towards SaaS and why (both Indian and non Indian) large institutions and corporations should take note. · Is the software providing you any value-add service such as business intelligence or data analytics? Solution: Imagine a virtual setup, which not only addresses the software application requirements but also provides scalability with cost-optimization and without any physical infrastructure or ownership costs. SaaS, Software as a Service, is a way of delivering software application services over internet (cloud) as per the client’s usage requirement. Have you heard these names before: Salesforce, Workday, ServiceNow, Shopify, HubSpot, Cloudera, Okta, Guidewire? Did you know these are Global SaaS providers? And heard about these: Freshdesk, Capillary, Zoho, WebEngage, Wingify, OrangeScape (Kissflow), Chargebee? Did you know these are India-based Global SaaS providers? 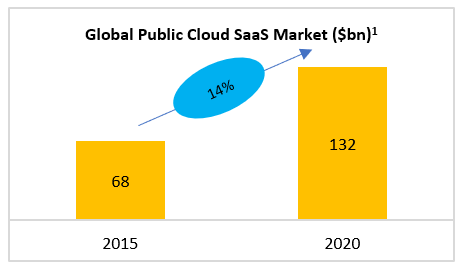 Global public cloud computing SaaS market is expected to grow from $68bn in 2015 to $132bn in 2020 at a 14% CAGR (Source 1). SaaS solutions are implementable horizontally across industries such as financial services, healthcare, retail, etc. for applications including CRM, HR, finance & accounting, business intelligence, data analytics, corporate governance, risk management, etc. SaaS solutions are also implementable vertically with a complete virtual software suite for a particular industry such as IBM’s Genelco for insurance industry. Thus, SaaS saves physical infrastructure and software ownership costs (converting ‘as on date’ balance sheet line-items to ‘for the period’ P&L line-items), allows for upgrades and scaling-up, reduces time to deployment and provides business insights via analytics. To stay in the game amidst tough competition, most businesses (SMB or large enterprise) today need to incorporate such cost efficient, scalable, upgradable, integrable and virtual software application services! SaaS is neither a sector nor a technology. It’s simply a subscription-based business delivery model. Alacrity India is a member of the global Alacrity ecosystem of early-stage technology startup funds and accelerators, with a focus on investing in India-based startups. As part of the global Alacrity ecosystem, Alacrity India brings world-class SaaS know-how and technology to India and combines it with best-in-class Indian mentors and technology to fund and scale Indian startups.